Please spread! According to Asahi Newspaper, 1172 iodine tablets were distributed to the workers and their families of Fukushima Medical University (which is in charge of Fukushima Prefecture Health Survey) secretly and they were told not to say this fact to public! This is so shocking and shameful fact, which could even listed as an evidence that residents in Fukushima have been really used as "Human gunea pigs" and could be regarded a "Crime against Humanity!" 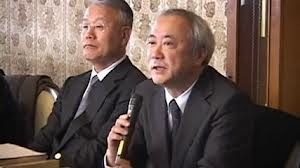 I strongly believe that Dr. Shunichi Yamashita (Vice Dean of Fukushima Medical University who insisted that children could play outside since dose under 100mSv is harmless) and Dr. Shinichi Suzuki (who insists that there has been no effect of radiation though 59 thyroid cancer and suspected cases are observed) need to answer to these questions! Dr. Shinichi Suzuki has been saying that thyroid cancer observed among Fukushima children is not due to the nuclear accident because it will take 4 or 5 years to develop thyroid cancer and age distribution have been the same as before. I think his remarks are quite surprising, which could even be regarded as a crime. In addition, I heard there was a lecture by a pediatrician in Nihonmatsu City, Fukushima, saying, "It will be OK because Dr. Shunichi Yamashita is saying OK."
This is just a horrendous phenomena. This pediatrician clearly has not read thesis written by Dr. Yamashita BEFORE THE ACCIDENT and has believed what he says, and exposing Fukushima children to danger of radiation. As for Shunichi Yamashita, there have been countless articles in and outside of Japan, so I didn't write a page particularly, but seems like there are many important points forgotten, so I will summarize them below. Dr. Yamashita wrote in March 2009 Japan Clinical Physicians' Journal, "(In Chernobyl) 20% of children who had nodule less than 10mm had thyroid cancer. 40% of thyroid cancer children had already matastasis on their lymph nodes though the size were small." Though Dr. Yamashita had such a finding before the Fukushima accident, he insisted, "Fukushima is safe. 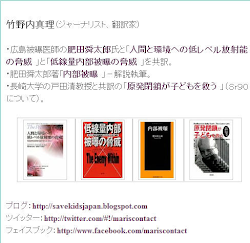 It is OK to play outside," after the accident and started his research on Fukushima kids. Isn't his deed an act of crime? I heard from a Fukushima mother that multiple number of thyroid cancer kids already have metastasis in their lymph nodes. However, Fukushima Medical University would not report on cancer metastasis at all. Why is this? As you know there are nearly 60 thyroid cancer kids in Fukushima, and if 40% of them had lymph metastasis as you have said before, this should be truly a grave situaiton. And you have never recommended kids to be evacuated under this situation. Don't you think you have been continuously commiting a crime against humanity? In September 2013 when I asked whether Fukushima Medical University would conduct gene test on thyroid cancer tissue of Fukushima children, surprisingly, their answer was, "No." he mentioned that obvious alternation on chromosome 9, FOXE! was observed among Chernobyl thyroid cancer kids. Why does Dr. Yamashita not mention about this important gene alternation inside Japan? Why isn't he conducting gene test in Fukushima? In addition, if chromosome band 7q11 was examined, it will clarify the cause of thyroid cancer whether it was due to radiation exposure or not. Why isn't this been conducted? In the US symposium, Dr. Yamashita mentioned that hyperlipidemia exist even at young ages and liver dysfunction and hyperuricemia increase at relatively young ages in male. Furthermore, hypertension, glucose dysmetabolism, and renal dysfunction increase in adulthood and are most common at older ages. Isn't it unscientific that Dr. Yamashita attribute all of the above symptoms solely to mental stress? In the same journal, Dr. Yamashita wrote, "It isn't possible to deny the risk for people under 20 year old to have cancer if they are exposed to excess radiation of 10~100mSv." Why did Dr. Yamashita declare that it will be safe for Fukushima residents including children and pregnant women to be exposed dto 100mSv of radiation. Did you conduct human experiment on Fukushima people? There are doctors, even pediatricians who repeat Dr. Yamashita's words. Due to your irresponsible words, especially children in Fukushima are victimized. And now as many as 59 children have got thyroid cancer or are suspected. Don't you think you should correct your words and extend appology to them immediately? Dr. Shinichi Suzuki is saying, "It is characteriscs of thyroid cancer to grow slowly, and according to the size of the cancer, they are not the ones developed after nuclear accident." However,　in 1998, Dr. Shunichi Yamashita himself wrote in Endocrine Journal, titled as "Childhood Thyroid Cancer: Comparison of Japan and Belarus" that "All of the preceding thyroid carcinomas developed after longer latency periods, whereas tumors arising in the Chernobyl population began developing with surprising rapidity and short latency"
Dr. Yamashita even mentioned rapidity and short latency of thyroid cancer after nuclear accident before March 11 Fukushima accident. Accordingly, don't you think Dr. Suzuki's presentation contradicts his boss Dr. Yamashita's remarks in the Endocrine Journal? In addition, Dr. Malko in Belarus talked about the latency of 2.5 years and University of California research team wrote about the shortest latency of 1 year even. What do you think of these studies and the fact that there are so many thyroid cancer children in Fukushima now. Prior to the Fukushima accident, Dr. Yamashita had been engaged in the group leader of "Resarch on long-term medical treatment of HIV/HCV hemophiliac patients" and at the beginning of the research, Dr. Yamashita wrote, "We will never make another mistake" (*Thousands of Japanese hemophiliac patients got infected with HIV due to some doctors' irresponsible use of tainted blood products which had already been banned outside of Japan). However, when Fukushima accident took place, Dr. Yamashita went to Fukushima to convince Fukushima resident not to worry unless they get exposed to 100mSv. On the above deed of Dr. Yamashita, a hemophiliac HIV patient, Mr. Yoshihiko Horiuchi, 1st class handicapped person and my dear friend, who has been visiting Fukushima to save Fukushima children, repeatedly tried to meet Dr. Yamashita. The other day, I heard from Mr. Horiuchi that Dr. Yamashita and his aide ran away from Mr. Horiuchi using stairways taking the advantage of the fact that Mr. Horiuchi cannot use stairways. Why did Dr. Yamashita do such a thing? Don't you feel shame on yourself?